So much beauty to look at this a.m. in your blog. I love the little wren.... We have been so warm & so much is up early. Just hope nothing gets frosted on the way to Summer!! What a wonderful post! Thanks so much for sharing at the Etsy Garden Party! So pretty, your lucky to have such pretty flowers to look at each day. Things haven't even begun to bloom here in Idaho...another month or so, I guess. I can hardly wait for the explosion of green and color. Hey pretty girl, what a beautiful spring post! Your photos are gorgeous, such lovely spring flowers, just perfect to wake up every morning and see natures beauty. 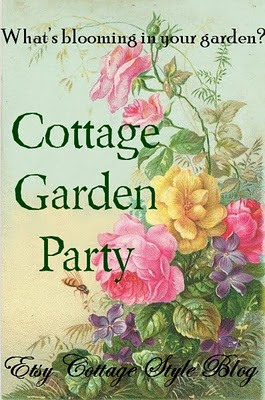 ECS Cottage Garden Party. Hope the storm wasn't too bad. By the time they get from you to us they fritter away..thank goodness. Love your sweet bird and nest...just wonderful. You've got so much blooming in the garden already, lucky you. I do have some daffodils here, our weather has been great as well so, all is good, we are having an early spring. Glad you liked the canvas cards. I did them for my licensing agency actually and just figured since I was doing that, I could make them on gallery canvas as keepsakes for people. I wish you great luck with yours and think it will be wonderful with your ETSY shop. I'm putting most if not all of my energies into licensing these days as I feel that is the way for me to go but I'm painting as much of it as I can on canvas so hopefully, can sell the art as well. Happy spring to you my friend...keep up the great work. Oh wow what a lot of flowers are already blooming in your garden! It's obvious that it's much warmer over there than that it's here in the Netherlands. I only have pansies blooming LOL! We even still have frost during the nights! I love your new paintwork. That wren is so so sweet! What a master painter you are! Everything you share is beautiful! Blessings, Milady! And happy Spring to you! Such amazing blooms already out where you are! We have buds here in Jersey, but no blooms other than daffodils and hyacinths. But, the buds promise greater things - don't you know! Love your painted roses - such sweet strokes and soft petals. Great idea with the bucket. Some of those finishing products look like something I might give a try using later this summer when I've promised myself to get back to crafting. School will be out and I'll hopefully have more art time! See you round the blog!